In July 2015 Sound Connections officially joined the Incorporated Society of Musicians’ (ISM) Bacc for the Future campaign. The campaign holds the view that if the Government plans to force every secondary school pupil to take a narrow range of subjects at GCSE (as proposed), there is a real risk that creative industry relevant qualifications – including GCSE, AS and A level in music and other arts subjects – will be forced out of many secondary schools. As our belief is that ‘music, alongside the other creative subjects, is central to the overall development of young people and should be at the heart of the curriculum’, we were keen to throw our weight behind the campaign, incorporating the voices of young people and members of our Wired4Music network. Bacc for the Future has been gathering momentum over the last year, with letters signed by key industry figures from the creative industries speaking of their concerns about the proposed EBacc being published in national newspapers, a hugely successful rolling Twitter campaign #Baccforthefuture, and meetings of All Party Parliamentary Groups (APPG) for music and creative arts and design. 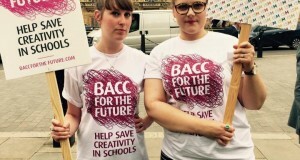 Over 100,000 people signed a petition calling for reforms to the EBacc, and a debate was set to be held in the House of Commons on Monday 4 July 2016. I went along to a joint APPG meeting held at Westminster on Thursday 30 June in the run-up to the debate, chaired by David Warburton MP. The room was packed with representatives of various arts, education and creative industries organisations, ranging from the Musicians’ Union, to the Craft Council, and the National Union of Teachers (NUT). Many issues people wanted raised in the debate focused around the economic benefits that creativity brings to our society (demonstrated by the fact that the creative industries currently contribute over £80bn to the UK economy every year), but little was said about whether any consultation with young people had occurred, and how they might feel about the proposals. I was grateful to have the opportunity to mention the Wired4Music survey report, and delighted when David Warburton asked me to send him a copy so he could reference it in the debate! On Monday 4 July, Siân and I joined a gathering outside the House of Commons organised by the ISM prior to the debate. In a show of solidarity for the arts, we enjoyed performances from Westcombe Brass quintet, and by students from the BRIT School, St Matthew’s Academy, and the Sujata Banerjee Dance Company. You can view a Storify summary and picture gallery of the gathering here. As for the debate itself? It was inspiring to watch a spirited debate and moving speeches made by MPs from across the political spectrum, with particularly powerful contributions from MPs Catherine McKinnell, David Lammy, and David Warbuton – who we are grateful to for mentioning Sound Connections and Wired4Music, and for referencing the survey report; a proud moment for our organisation. Sadly, Schools’ Minister Nick Gibb MP failed to address the many valid concerns raised by MPs, did not give any sign of amending the proposals, and did not respond to recent figures raised showing the worrying decline in the take-up of arts subjects at GCSE. This was really disheartening, but served to galvanise a feeling to those watching in the gallery that our work here is by no means done. We have to continue to fight for an equitable arts education for all – especially in the face of an education establishment whose principles are guided by an austerity agenda. We’re in this together, young people, arts organisations, charities, artists and policy-makers alike – we need to keep working together as one strong opposing voice. You can watch the full EBacc debate here, and read the transcript here. The next campaign meeting arranged by the ISM will take place on Wednesday 3 August 2016, 4-5pm at ISM Headquarters, 4–5 Inverness Mews, London W2 3JQ. To find out more, please contact derin.adebiyi@ism.org directly.